A conservation group on Wednesday finally got the go-ahead to release captive orangutans back into the wild, following a nine-year hyatus marked by zero releases. Restorasi Habitat Orangutan Indonesia, a subsidiary of the Borneo Orangutan Survival Foundation, was awarded a concession for an orangutan release area by the Ministry of Forestry in August 2010. The concession covers 86,540 hectares of previously logged land in East Kalimantan, for which the RHOI must pay a license fee of Rp 13 billion ($1.4 million) over the next 60 years. But the sluggish bureaucratic process meant the group only now received approval to start releasing the apes back into the wild. “In addition to the concession we’ve been granted by the Forestry Ministry, we plan to add another 23,000 hectares in the northern part of East Kalimantan, because not all the land we got is suitable as an orangutan release habitat,” said Togu Manurung, chairman of the BOS Foundation. He said each orangutan would ideally require at least 150 hectares of forest in which to roam, given its wide home range. “We’ll release the orangutans in several phases through 2015,” Togu said. He said the BOS Foundation currently housed 620 orangutans at its Nyaru Menteng rehabilitation center in Palangkaraya, Central Kalimantan, but not all the animals were ready to be released back into the wild. “Some of them are suffering from illnesses such as hepatitis and tuberculosis,” Togu said. Initially, the foundation will release between 24 and 30 orangutans back into the wild this May, he said. The BOS Foundation, a non-profit organization established in 1991, focuses on preparing orangutans to be reintroduced to their natural environment at its rehabilitation centers. Togu said the BOS Foundation had been unable to release any apes since 2002 because of the difficulty in finding suitable habitats for them. 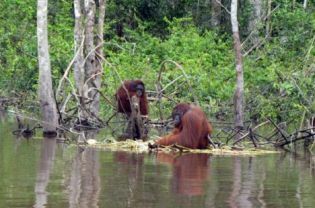 Between 1992 and 2002 the group released 450 orangutans in East Kalimantan. “This is a serious matter because orangutans are on the verge of extinction,” he said. Togu said now that the land was officially dedicated for orangutan releases, the BOS Foundation’s next challenge would be to finance the release of each of the apes. “Preparing each orangutan for release will cost around Rp 2 million to Rp 2.4 million,” he said. Given the number of orangutans the foundation plans to release, “that adds up to a lot of money,” he said. He proposed the government waive the $1.4 million license fee in exchange for the foundation carrying out ecosystem restoration efforts. “That’s because we’ll be doing what is essentially the government’s duty to protect orangutans, which are considered an endangered species,” Togu said. He added his organization would also seek to raise funds for the orangutan release program through carbon-trading schemes within the concession area it was granted by the government.